Welcome to the 2019 Spring Festival Reception hosted by the Embassy of the People’s Republic of China in the Commonwealth of The Bahamas. This year is the Year of Pig in Chinese Lunar calendar. In the Chinese zodiac culture, Pig is the symbol of luck and wealth. 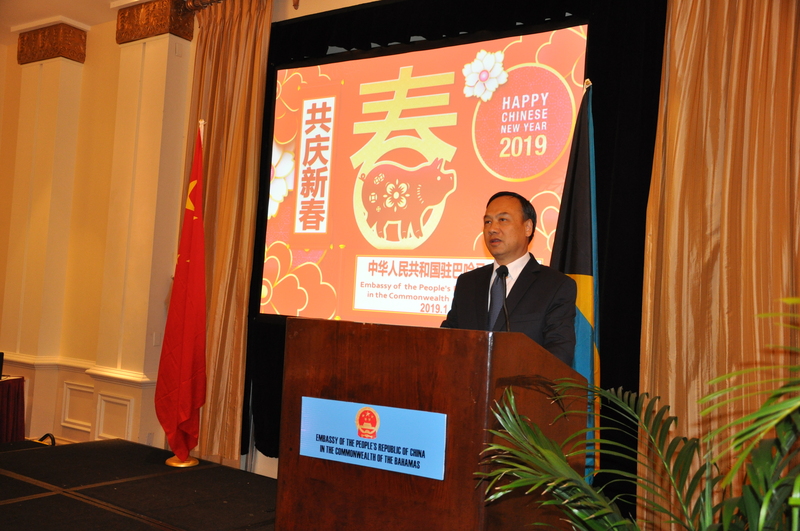 On the occasion of the Pig Year, on behalf of the Chinese Embassy in The Bahamas, I wish everyone present, all overseas Chinese Bahamians, employees of Chinese enterprises in The Bahamas, and our Bahamian friends a happy and prosperous new year. The past year of 2018 is the beginning year of the comprehensive implementation of the spirit of the 19th National Congress of the Communist Party of China. Under the strong leadership of Central Committee of the Communist Party of China with Comrade Xi Jinping as the core, the Chinese Government adheres to the guideline of making progress while maintaining stability, and firmly practices the new development concepts, remarkable progress has been achieved in all respects of China’s development. In the past year, China’s economic development has progressed steadily, with GDP growth of 6.6% year-on-year and total import and export volume of goods increasing by 9.7% ,which continues to be the largest contributor to world economic growth. In the past year, over 13 million urban and rural jobs have been created, and more than 10 million rural residents have been lifted out of poverty. In the past year, China’s scientific and technological innovations are fruitful, the Chang'e IV detector successfully landed on the back of the moon, the Beidou navigation system began to provide global basic navigation services, the 55-kilometer long HongKong-Zhuhai-Macao bridge officially opened to traffic. In the past year, China solemnly celebrated the 40th anniversary of its reform and opening up and launched more than 100 important reform measures, which demonstrated China's determination of furthering the reform and opening up. I am glad to see that the China-Bahamas relations have maintained a sound momentum of development over the past year. The two countries have maintained frequent high-level exchanges,resulting in the consolidation of mutual political trust. Last July, the Hon. Desmond Bannister, Minister of Public Works, attended the 2018 Ministerial Seminar on Urban Planning and Construction of Developing Countries in Shanghai and visited China, both sides agreed to strengthen the cooperation in infrastructure construction and other areas. Last November, the Hon. Darren Henfield, Minister of Foreign Affairs, and the Hon. 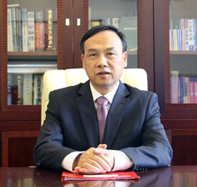 Dionisio D’Aguilar, Minister of Tourism, attended the first China International Import Expo in Shanghai, which further expanded the bilateral cooperation between China and The Bahamas. Further more, steady progress has been made in economic and trade cooperation, the Baha Mar Resort has fully opened. The second phase of The Pointe project, the main structure of the Condominium has recently been completed and the Entertainment Center has been fully operational. The North Abaco Port project was successfully completed and handed over to The Bahamas Government. The agreements of direct flight between China and Bahamas and Bahamas live lobster export to China will be officially signed soon. In 2018, 11 Bahamian students won Chinese government scholarships and dozens of people went to China to attend seminars and workshops. The number of Chinese tourists to The Bahamas is increasing rapidly. The positive development of China-Bahamas relations can not only be attributed to the vigorous promotion of the two governments, but also the active support and hard work of Bahamian Chinese, Chinese enterprises in The Bahamas and our Bahamian friends. On behalf of the Chinese Embassy in the Bahamas, I would like to express my sincere gratitude to all of you, for your support to the works of the Chinese Embassy and your efforts in promoting China-Bahamas relations. In the New Year, my colleagues and I will make joint efforts, together with you to make greater contributions to the bilateral relations. The year of 2019 marks the 70th anniversary of the founding of the People's Republic of China, and is also a crucial year for China to complete its goal of building a moderately prosperous society in all respects. China will continue to deepen its reforms and open wider to the world, promote the vision of a community with a shared future for mankind, stand firmly to preserve the existing international order, actively participate in global governance, pursue win-win cooperation, and make unremitting efforts to build a more prosperous and beautiful world. At the same time, China and The Bahamas will embrace the important development opportunities together. This year, China will host the second Belt and Road Forum for International Cooperation and the second China International Import Expo. Since the Belt and Road initiative (BRI) was proposed six years ago, more than 140 countries and international organizations have signed cooperation MOU with China. Latin America and the Caribbean countries has become important participants of the BRI. Most of Caribbean countries have signed the BRI cooperation documents with China. China is willing to work with other countries, listen to the views of all parties, continue to promote the construction of the BRI and the building of open global economy. We welcome The Bahamas’ participation in the BRI and hope that both sides will take this opportunity to deepen cooperation and exchanges in various fields, constantly enrich the connotations of the bilateral relations and promote our friendship to a new high.